Sometimes in order to save the world tough choices have to be made. 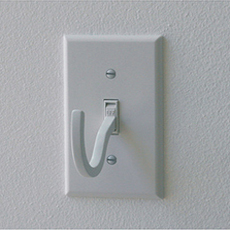 You’ll have to choose between leaving the light on or hanging your jacket with the OFF Light Switch Hook. While in the off position you can hang something around the attached hook, reminding you to conserve energy by leaving the lights off. Even if it never persuades you to turn the light off more often it might make you at least aware of your bad habits.